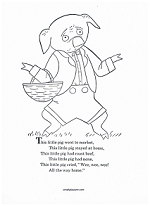 A full version of the This Little Piggy lyrics was published in Tommy Thumb's Little Story-Book around 1760 in London. The first time that most children hear the lyrics is before they are able to talk. The rhyme is usually counted out on a infant's toes, each line corresponding to a different toe. 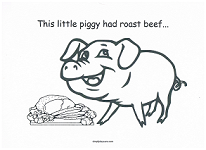 The rhyme typically starts with the big toe and ends with the little toe. 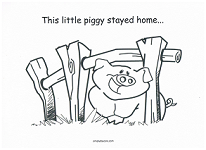 Many parents add a foot tickle during the the "Wee... all the way home" part of the last line. 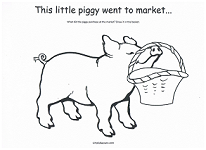 Preschoolers still love the rhyme and are thrilled when they are able to recite the poem themselves. Even when not using toes for the rhyme, it's fun to say especially when activities are included. 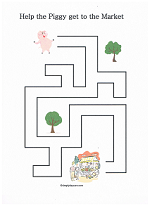 So, once the rhyme is learned, choose one of the activity pages below for added fun. 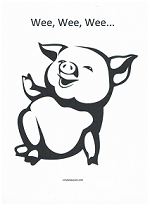 And this little piggy cried "wee wee wee" all the way home.